My drafting table was getting full and my file draws were stuffed with landscape designs. After twenty plus years in the landscape design and installation business, it was time to clean house. 5 huge armfuls of landscape plans, as much as I could carry at one time, literally up in smoke. I was sad to see some of them go since so much time and energy was invested in each plan. Looking forward to filling the files draws back up over the next 20 years. Posted below are two old, forgotten friends. 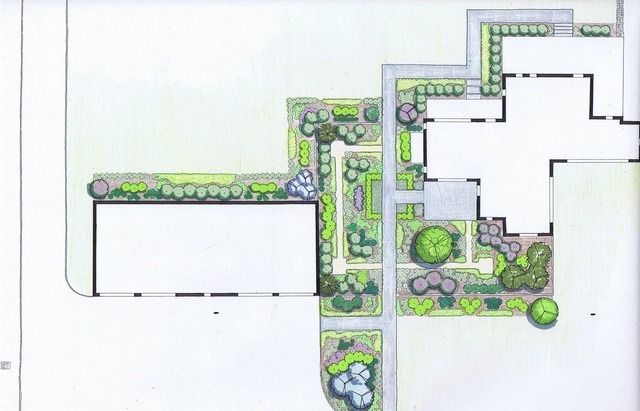 Neither of these landscape plans have ever been posted on our website, they have never been included in our quarterly newsletter or any of our other marketing materials. They were deserving. That seems reasonable. About 10-15 years ago I had a plan scanned in something called a drum scanner? for $45. Since then I’ve been bringing things to my printer. He reduces them (not to scan) onto a small piece of paper that I then scan with a flatbed scanner. 3 plans, 3 copies each for $5.